WELCOME to Real Deep Dish! Make Chicago Style Italian Sausage for Pizza! Pizza De Mayo 2011 is over, and the photos need to be sorted, cropped, and awesome-tastic-o-fied, so until I complete this post, please enjoy this teaser photo of ‘Deep Dish MEATZA 2 (Electric Meataloo)’. 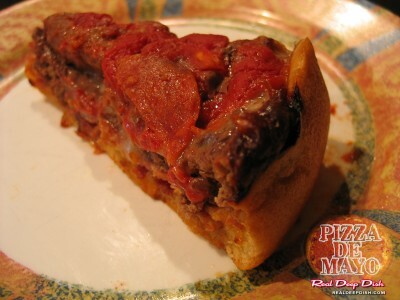 A photo of a partially devoured Deep Dish 'Meatza' from PIZZA de MAYO 2011. Also pictured in the back, a sausage, pepperoni, mushroom and sweet pepper combo. Not pictured: a 14" Italian sausage patty / pepperoni combo, and the best 12" spinach /garlic with provolone and mozzarella. We were too busy eating them to take their picture. 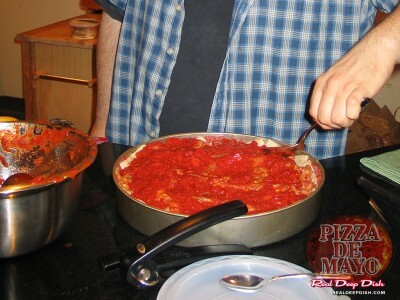 You can also read about last year’s Pizza De Mayo post here. 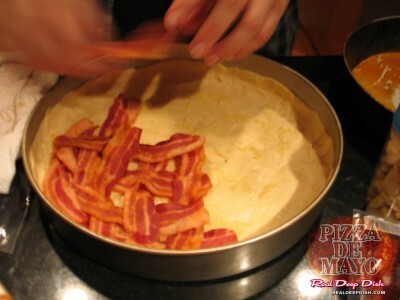 If you’ve read about last year’s Pizza de Mayo , you may know that I’ve already made a deep dish ‘meatza’. The original intent was to see if I could make a deep dish pizza with a meat crust instead of the traditional dough crust. I had always intended to try making it more than once, so the first attempt was always considered a learning experience. I did learn valuable things from the first attempt and was ready to try again. This year, the plan was very much about grease control and stability. Last year when I built the Meatza, I used raw bacon for the bottom and filled in the gaps with ground beef, as well as using ground beef for the entire outer lip. This year, I eliminated the major contributor to last year’s grease-overload by pre-cooking the bacon (2 lbs of it). I cooked the strips until they were almost crispy, but still soft enough to bend, draining them on layers of paper towels. Last year, I didn’t have enough ground beef to cover the whole bottom. This year I made sure we had plenty of ground sirloin to cover the bacon. (I will probably be making a batch of chili later in the week; I bought too much beef this time). Instead of an entire patty of Italian sausage, I put a criss-cross lattice of sausage, and then placed pepperoni sparingly on the top in the spaces between. In a slight variation from the theme, I took out extra insurance on the grease-factor this year by surrounding the bacon/beef crust with a traditional deep dish pizza dough crust. Why put all that amazing flavor to waste as drippings in the pan when you can soak it up in the crust ? This turned out to be the best thing because it tasted incredible, but also increased stability of the entire Meatza and made serving easier. 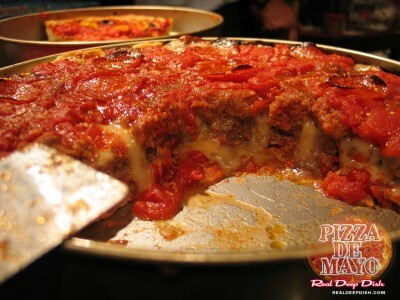 I hope some of you are able to make it out next year for Pizza de Mayo 2012, which will feature a variety of deep dish pizzas, where you will very likely encounter DEEP DISH MEATZA 3 : Subtitle TBD. 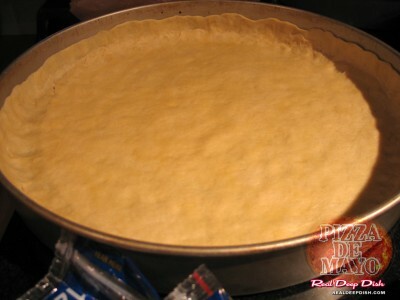 Different from the previous attempt, I opt to use a standard deep dish crust for the base. This turns out to be a great move. This is a 12″ round aluminized steel cake pan. I call this a medium deep dish pan. After a liberal sprinkling of crushed garlic, the bacon lattice is applied. Yeah. Bacon lattice. It’s a thing. Some of my guests had commented that they'd never seen anyone weave bacon before. See the bacon on the left? That’s TWO POUNDS (pre-cooked weight). I cooked them all the night before and didn’t eat one slice! How’s that for discipline? Yes, we used ALL OF IT in the Meatza! 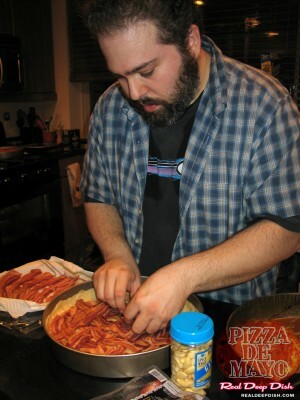 The original reason to weave the bacon into a lattice was that it WAS the bottom of the Meatza. Only AFTER weaving this over a pizza dough crust did I realize I probably didn’t need to be so precise. 2 lbs of lean ground sirloin are pressed into a solid patty and worked up the sides. Then comes the cheese. A full layer of ground beef would add to the stability of the Meatza. A layer of sliced mozzarella going on top of the ground beef. A criss-cross of italian sausage was added, but the photographers took a break to eat pizza. Crushed tomatoes are added to cover the pie. Then, a sprinkling of parmesan/romano and IN TO THE OVEN! Wow! Look at how there’s a bit of caramelized cheese on the outer crust, and that bit of char on the pepperoni! If you look close enough, you can see the criss-crossed italian sausage. At this moment, I am so happy I pre-cooked the bacon. It came out perfect! Hey! STOP LICKING THE SCREEN! Who wants the first heart-atta....err, I mean who wants the first slice? Look at the strings of cheese hanging from that first slice! Dang! Blogging is sure making me hungry! BRB. Gonna nuke a slice! Meatza - closeup (reheated). This slice was eaten minutes after shooting and uploading this photo. So, how should we configure Meatza 3? Bacon on top? 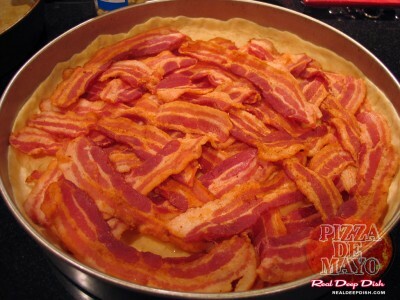 Bacon below the dough? Beef on the outside? Additional tasty (possibly endangered) animals? Some other artistically formed meat pattern? Tune in next year for PIZZZZZZZZAAAAAA De MAAAAAAAAAAYOOOOOOOOOOOOOO!!!! (insert superhero tv show music & roll credits). Hey, thank you so much for all the work, planning, trial & error, and food-love that went into making a delicious Pizza de Mayo. Wow! A Diet pizza! Sure looks good and filling! Essentially, you are correct. 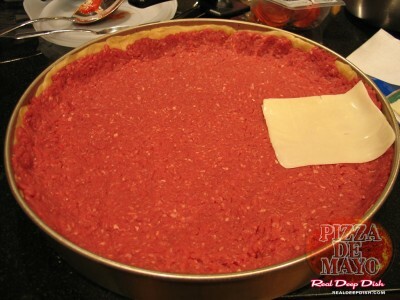 The original intent of Meatza is to make a meat crust. Original Meatza had a meat crust made from bacon and ground beef. 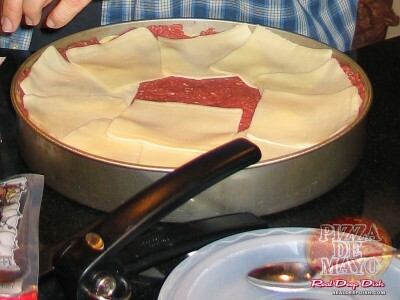 Meatza 2 had an outer crust made from deep dish dough to soak up the tasty, tasty meat juices from the beef, sausage and bacon. p.s. – I love that you included my photo in your post, but I’d appreciate if you asked me for permission first. Thanks. 1 Pings/Trackbacks for "Pizza De Mayo 2011, featuring Deep Dish MEATZA 2 (Electric Meataloo)"
When you buy great items like this Deep Dish Pan, you are supporting this website. Thanks! I'm impatient! Where's the recipe?! Look for the links below with asterisks. and get a crash course in Real Deep Dish! 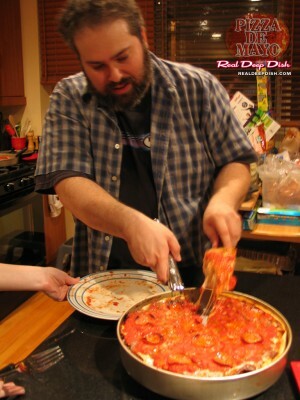 Rant 2.5 - Chicago Style Deep Dish Pizza SUCCESS! Rant 5 - Nice Tomaters! Photos and images used on this website are property of their originators or copyright holders. 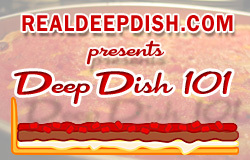 Original content created for RealDeepDish.com is property of its creator. Food photos may be available for sale or license. For the Love of Deep Dish, MAKE A PIZZA ALREADY! Want to read more about Deep Dish? is NOW OPEN at CafePress! 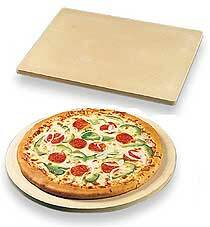 When you buy great items like these Pizza Stones, you are supporting this website. Thanks! Connie's Connie’s is well known for STUFFED pizza, but has many styles of pizza on their menu, including deep dish. 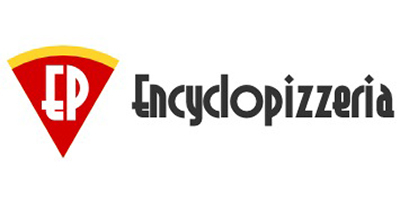 Encyclopizzeria﻿! Pizza Resources It’s like someone made an encyclopedia ENTIRELY OUT OF PIZZA! Gino's East Hey, Taxi! Where can I find some good Chicago Pizza (and a website built entirely in Flash)? Giordano's Giordano’s is known for their really good STUFFED pizza. This is not original deep dish. That is all. My Pi (3.1415926…etc.) Great pizza can be found here! 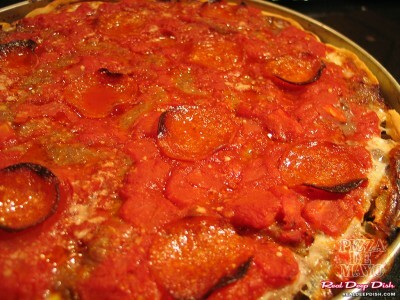 Pequod's A Chicago/Detroit/Sicilian Hybrid – Possibly the best pan pizza I’ve ever eaten, except for my own, of course. Pizzamaking.com The community-driven home of all things PIZZA. Pizzeria Uno (and more recently Uno's Chicago Grill) Come on, Boston. We thought you were cool. The United States of Pizza: Illinois – Chicago Serious Eats presents a good primer on the pizzas of Chicago. Often, people type “best deep dish pizza recipe” or “best chicago deep dish recipe” or “best chicago style deep dish recipe” or “authentic chicago deep dish” or “easy deep dish” or “real deep dish” into their search engine, and although I think the recipe on this site is a pretty darn good representation of the style, it’s really up to you to decide whether this is a good deep dish or a very good deep dish or a great deep dish or the best deep dish. Sometimes people just want to know how to make deep dish pizza dough & other times they just want to bake the best deep dish pizza at home that they can. Many think the Chicago Style Pizza Recipe is closest to Lou Malnati’s, but sometimes misspell it as Malnotti and others think it’s closer to PIzzeria Uno or Pizzeria Due, but it’s not really like Gino’s East, and it certainly is nothing like Uno’s Chicago Grill, and hopefully we can show you why in the DeepDish 101 section of the site. 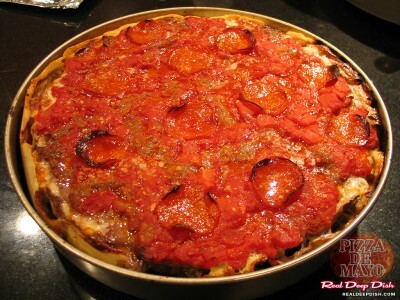 In any case, my website ramblings have probably increased the chances of you finding a good place to start learning about Chicago Style Pizza, so welcome and good luck on your quest for ultimate deep dish pizza happiness! And hey, if deep dish isn’t your thing, you can give Chicago Thin Crust Pizza a try, which some people also call “bar pizza”, “tavern pizza”, “square cut” or “box cut” because there’s a thin crust recipe too!